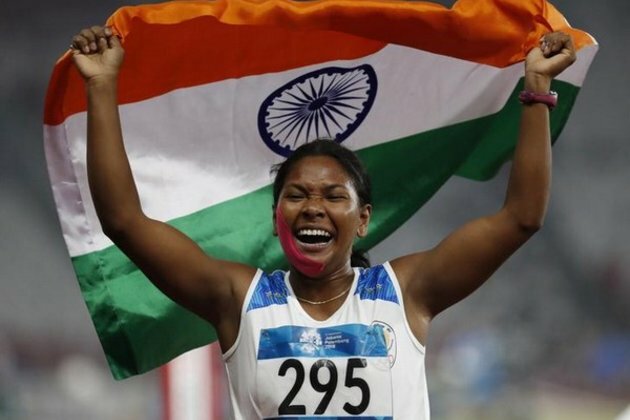 Kolkata (West Bengal) [India], Nov 6 (ANI): Swapna Barman, who won the first Asian Games gold medal in Heptathlon, is anxiously waiting for the 7 pairs of customized shoes being designed by apparel giants Adidas. Barman in a freewheeling chat with ANI said that she doesn't know whether the shoe will be good or bad. "I hope it will be good," she said. Stating that she hasn't worn any customized footwear in her life, she added, "First of all I want to thank Adidas for making a customized shoe for me. I don't know what will happen after wearing them because I haven't performed in a competition or trained wearing customized shoes." Highlighting the tale of excruciating pain she has suffered over the years, she asserted, "There are six toes in each of my feet. The normal shoes that I used to wear earlier are meant for five toes. When I run and train, there is excruciating pain in my feet." She visited Germany a few days ago for giving the measurements of her feet. "Soon they will give me my shoe. I am excited and waiting for the shoe. Now, that I have joined Adidas I cannot wear other shoes," Swapna quipped.